This optional small card has 3 functions that will add som features to your RLM setup. It has a linkradio watchdog that will switch off the link-transmitter if the transmission has been going on for longer than 5 minutes. Then it has a computer-hang watchdog timer that will restart the computer if RLM doesn't produce the watchdog pulse that is coming from the interface. And at last it has a 1750Hz accesstone decoder for repeater activations. You need this interface to have your RLM system to work. It connects to the computers parallel port and to 12V power supply. 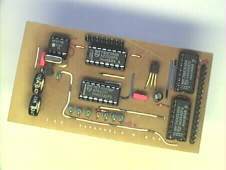 The interface gives you 16 out ports (0-5v), 5 in-ports and DTMF decoding function. 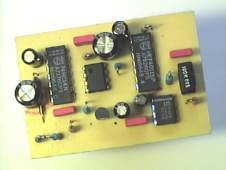 This very simple audiomixer is for mixing together soundcard, rpt radios, linkradio and other stuff. 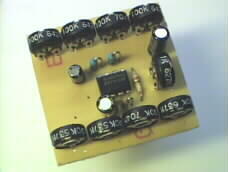 The amplifier is based of an 741 OP-amp. The mixer has 4 inputs and 4 outputs, all adjustable with individual potentiometers. It also has a master volume. This is mixer is optional and if you hav a simple RLM setup it may not be needed.